Sweet Fancy Treat: Friday Bloggers: What is your favorite Tim Gunn advice? Friday Bloggers: What is your favorite Tim Gunn advice? This installment of Friday Bloggers is all new and different! Why? Because we all need the occasional wardrobe change, don't we? If you are new to the series, here is how it goes: each Friday, I ask a blogging-related question which we all answer. The result is a valuable and delightful compendium in which we all share our opinions and experiences. But today... there is a twist. If you are as familiar with Project Runway as I am, this phrase alone should get you thinking. I love Tim Gunn. I LOVE Tim Gunn. He could make me work harder than ever on anything. He is a real life persona and a respected critic. And guess what? He is always right! Sometimes I even wish I had him taking a look over my shoulder at my writing because I know he could improve it. This is why this week we are taking some of Mr. Gunn's famous sayings and turn them to blogging incentives. 1. "This worries me" means... "Analise your blog with a critical eye." 2. "Talk to me" means... "Fix the problems, if any (I trust you!)" 3. "Make it work" means... "Choose a path and stick to it." 4. "Carry on" means... "You are doing great!" 5. "Go, go go!" means "Push yourself!" What is your favorite Tim Gunn advice? My favorite piece of advice must be "Make it work". It is so epic and applies not only to fashion and blogging but also to various aspects of our daily life. Just try it! ♥ How do you beat bloggers block? ♥ Do you blog on weekends? ♥ Do you dress up when you blog? ♥ Would you turn off comments on your blog? ♥ What would you ask the blog fairy for? ♥ How did you choose the name of your blog? ♥ Why do you blog? ♥ Do you moderate comments on your blog? "Make it work" is my favourite piece of advice as well. I particularly like when he is describing something using super weird words. He's just plain awesome and he's the best part of Project Runway. I think Talk to Me is a favorite! It applies to a lot of conversations I have with one of the most important people in my life. My boyfriend/son's father. We communicate very well telling each other how we feel & trusting each other to progress. I think that's something a lot of relationships lack! Between boyfriend and girlfriend, mom and child, mentor to student...whatever! Great blog topic! Lol, I just love Tim Gunn...my fave "translation": "Talk to me" means... "Fix the problems, if any (I trust you!)" SO TRUE! Haha! 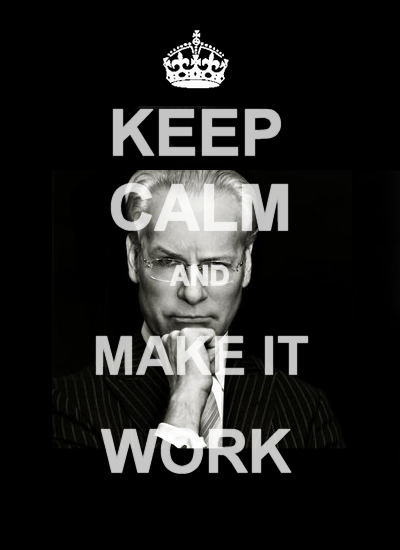 "Make it work" is my favourite Tim Gunn piece of advice.